Hinduism What do Hindus believe? “I am the taste in the water, the radiance in the sun and moon,.I am the sound in space, I am the Strength in humanity. I am the sweet fragrance in the earth. I am the brilliance in fire. I am the life in all things." Hinduism is a religious tradition that began about 5 000 years ago. The name "Hindu" came from Muslims that invaded India in 1 200 AD because they wanted to distinguish between their own religion and that of the inhabitants of India. "Hindu" is the Persian word for "Indian". This shows that most Hindus are also Indian and today about 400 million Indians are Hindus. Indian people call it the eternal teaching or law, or "sanatana dharma". Hinduism is practiced in different ways around the world and in is a culture and a way of life. 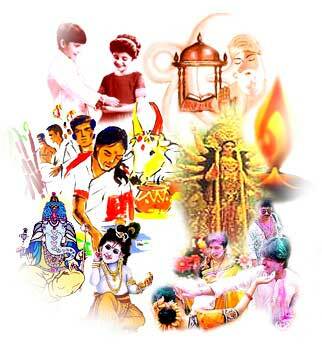 Hindus also believe that God has many different ways of being known and acting, and has different forms. As the creator of everything he is known as Brahma, but without his action the world can't continue to exist. His form that keeps everything going is known as Vishnu. Vishnu protects the world against evil and Hindus believe that he has come to earth in 10 different forms called avatars. Krishna and Rama are to of the best known and well loved. Hindus believe that when the world comes to an end and everything is destroyed god takes the form of Shiva, who destroys everything so that new life can begin. There are hundreds of forms of god like Ganesha, the god of good beginnings and Lakshmi the goddess of wealth. Hindus also believe in reincarnation and are vegetarians. Their purpose is to be reunited with God so that they can escape the cycle of life and death in this world. The Bhagavad Gita includes three ways to this. The first is knowledge. This means that you have to study ancient Hindu texts and to think deeply about the meaning or our world and the universe. The second way, or path, is yoga. This is a way to exercise the mind and body to help you meditate better and deeper. The third path is bhakti, which means devotion. This is to develop and express a love for God by praying and through service in different ways. Hindus are generally vegetarian, and don't eat meat. They have great respect for all living creatures because of their belief in reincarnation and a soul in each creature. To them all living things are part of the same spirit. This means that all creatures are the same and are in a different stage of working towards a better life. Hindus see cattle as holy so they never eat beef. They provide milk for food and oil for cooking and light. Cattle dung is also used as fuel for fire and bulls are used to ride on or to draw carts and ploughs. Cows also have a gentle nature and Hindus feel that people should treat each other with the same gentleness. To the Hindu’s believe that a person may be reborn again and again into a different living thing, depending on the person's own actions during their lives. For example if you were a very good person you might come back as a God or as a rich and happy person, but if you did not live a good life you might come back to earth as a fly or a ghost. Some of the most celebrated Hindu festivals in South Africa are Diwali, the Festival of Light, Kavadi, and Draupadi, the fire walking festival. These festivals are very colourful and fun even though they are holy events. Diwali is held in October or November and is also known as the Hindu New Year. It is a festival of lights and followers give each other gifts. They believe that Lakshmi, the goddess of good fortune, visits all homes that are lit with lamps. Kavadi is twice in the year and takes place in January or February or April or May. Kavadi is held to honour the god Muruga or Subrahmanya, who is believed to have great healing power and can drive away misfortune. The name Kavadi comes from the carrying of decorated frames or kavadis. Traditional temples in KwaZulu Natal usually host fire walking during March, April or May to celebrate and honour the goddess Draupadi. Devotees take a vow to test their faith. They walk over a 10m long fire pit. Amazingly their feet are unburned and this is seen as proof of their faith and devotion to God. Various rituals and dramas are performed to remember the trials of Draupadi and the highlight is reached when the devotees walk across the fire pit. An image of Draupadi is placed at the end of the fire pit to guide and protect the faithful devotees as they walk across. It also blesses them and gives new life and health to the whole community. Ohm is the most important Hindu symbol and is found in every prayer and temple and represents Brahma. It is also a sound used to focus the mind on God energy. Saffron is not only worn by Hindus, but also by Buddhists and Muslims, but symbolises different things. For Hindus and Buddhists it shows the rejection of material things while Muslims see it as a military colour. It also represents fire and Brahma.